Have you ever spent years on a project? The first time I undertook a long and difficult project was after I graduated from high school. My Grandmother Hill gave me some money as a graduation present because she knew that I wanted a tablecloth. The tablecloth that I wanted was not just any tablecloth. It was plain linen; however, it wouldn’t stay that way for long. It came stamped with a border and center motif already on the cloth. My plan was to hand embroider the entire tablecloth. For as long as my eighteen year-old self could remember, I had wanted to hand embroider a tablecloth all on my own. This was quite a lofty goal and it took me several years to bring this project to completion. The finished product was a beautiful white linen embellished with taupe scrollwork. I even embroidered matching napkins to complement it. I was delighted to later find a gorgeous set of Lennox lace point dishes that matched the tablecloth. That pattern of dishes was only produced for two years, so they were quite a find. The tablecloth, napkins, and dishes all combined to make a tablescape that I am still proud of to this day. The process of embroidering took years, but I learned a lot about patience and discipline in order to complete the project. If you have never undertaken an especially labor-intensive project, I highly recommend it. Though it may seem daunting at first, you are capable of far more than you think, once you discipline yourself. Even if it takes you years to complete, it will be worth it in the end. Have you ever taken on such a labor-intensive project? What a lovely tablecloth and resulting tablescape! While I’ve never done anything quite this extensive, I have been richly blessed as a result of another woman’s commitment to embroidery and persistance! The late Dr. Roberta Edwards, missionary doctor to Nigeria in the 1940’s, gifted me with an embroidered cloth and a dozen napkins adorned with a Christmas greenery motif in appropriate colors. It fits my table that will seat twelve. It is the base for our annual family dinner! I was fortunate enough to receive a beautiful embroidered tablecloth, not unlike your own, from my best friend’s grandmother. She was a lovely dear lady who still believed that no self-respecting southern bride could “set up housekeeping” without at least one, even though at that time my friend and I were wearing halters and bell bottoms without shoes. Thank heaven for her foresight, talent, and generosity. I really came to appreciate the dedication involved when I began my own project in college; a sampler of the twenty third psalm with a border like an illuminated manuscript in over twenty different colors. I didn’t finish for many years but when I did, I splurged on a very lovely mat and frame to show it off. I may never manage to duplicate that feat but I know that I smile every time I look at either of these beautiful pieces of my life’s history. Math was never my strong suit, but I know that two pieces won’t spread to four children and a growing brood of grand babies. I’d better get busy!!! Beautiful linens. I am so glad to see that someone else enjoys setting a pretty formal table. Oh, I think I have the same tablecloth! My Aunt Marcy started it for my wedding and finished the napkins, but not all the tablecloth before she died of breast cancer. Embarrassed to admit, but with 4 babies coming in quick succession and then home schooling, I never attempted to finish it. My last child graduates from homeschooling this year and I think I need to hunt it up and get busy before my eyes go. Your picture is lovely! There is so much to learn from working on a long term project. We learn endurance, patience and of course the great feeling when we complete the project. Thank you for sharing your experience with us. My mother embroidered a cloth similar to this, with a Christmas Holly theme, and napkins to match. It is something I treasure and I love having her over for a Christmas luncheon using that fabulous gift and Lenox Holiday! It is very much a labor of love! What a gorgeous and stunningly sophisticated table setting! My mother was the embroiderer, quilter, seamstress. She is 95 now and for many years has been unable to do any of that lovely handwork, but she has made and given beautiful, one-of-a-kind pieces to every child and grandchild over the years when she did. Her final gift to every child and grandchild the last Christmas she could do all that was a double to king sized quilt especially themed for the receiver. One of my many other gifts she made for me over the years is a lovely embroidered tablecloth with matching napkins that I treasure. I am a true fan of hand embroidery! I love the soothing color palette of your linens, too. I try to keep projects stamped and ready to do anytime I need something to do during “wait” time. My faves range from the utilitarian like tea towels and aprons to blouses, nightgowns , hankies as well as table cloths and napkins. Using pretty things lends a touch of elegance to everything! I once spent over 2 years on a counted cross-stitched angel. She was beautiful in shades of mauve and blue. I had her framed in a very unique way and have had her for all these years to enjoy and grace my foyer. It was so worth all the time and effort it took to make and I hope it will bring joy to my family long after I am gone. I wish we could have seen more of it, the center motif for example. When we do things that take a few years or so I think we appreciate more especially when it turns out so lovely. Thanks for sharing. My Aunt Mona made me one for my wedding gift. It touches my heart to think how many hours she spent making me something so special. Now that she’s no,longer with us, it means even more. Funny, I just added my mother’s hand embroidered tablecloth to my dining room table. She made the table cloth also and it has ecru lace around it. I have a set of napkins she also made and embroidered. It is one of my favorite things of my mother’s. Your Journal Entry and each response has touched my emotions – almost to tears . So very moving , so very lovely . Thank you ! What a treat for me this morning to see your beautiful tablecloth and your Lenox “Lace Point” China. Funny enough, as I sit drinking my tea, it’s in my “Lace Point” china! My husband chose the pattern for our registry 34 years ago. I wasn’t very fond of it then, but have grown to love it over time. It has become my autumn dishware so we can all enjoy it. Your lovely handwork inspires me to, perhaps, pull out one of my unfinished projects from my over ambitious past. Thank you for a lovely visual treat this morning. Wishing all you ladies a blessed day. Thank you for the beautiful story, your incredible. You even upholstered your dining chairs to match your Lenox china, such an eye for detail! I have embroidered 3 king size quilts, a number of pillows, did candlewicking table runners and some large pictures. It’s a great project while waiting in a doctor’s office or waiting for surgery to be done. My hands have to be busy. Recently at an estate sale they were going to pitch a beautiful hand done embroidered tablecloth because of a couple spots. I bought it for $.25 and brought it home and removed the spots. I use it and get so many comments. That is beautiful Phyllis. I love the colours. I tried to embroider when I was young but failed miserably…did not have the patience or talent. One of my closest friends however, crocheted a beautiful afghan and matching pillow for me in highschool. I can only imagine what a big undertaking that was for her…a true labour of love! We are still close friends and I still have that afghan. You did beautiful work. It is quite stunning and truly a work of art to be very proud of. I needlepoint, and have undertaken several time-consuming projects. There is something very satisfying in the repetition of stitching and the thought process needed to complete a needlepoint project. This was something I always wanted to learn to do sometime in my lifetime and I have been pursuing my needlepoint hobby for over 30 years now! Thank you for yet another beautiful and inspiring blog message. I so enjoying your thoughts!! Oh what amazing needlework, Phyllis!! Simply stunning!! And at your young age. Beautiful! Thanks for again sharing that special part of your life…..
As an avid stitcher, I almost always have a project going (currently the annual Christmas ornaments I make for my nieces). I have often looked at the tablecloths with admiration, but have not made the move to stitch one. Your work is beautiful and inspirational, Phyllis. What a lovely table setting. As you pull out your hand-stitched tablecloth, there must be so many memories of your grandmother that come to mind. And it must bring you so much joy as family and friends gather together to enjoy a meal, and each others company, at this table. Sixty nine years ago my mother began a baby quilt with a design of little lambs when she was pregnant with me, but for some reason she never finished it. Years later I worked on it sporadically, and then my children practiced their embroidery and for some reason decided to sew a piece of foam rubber on it. As time went on we forgot about it. Now my youngest daughter is expecting a little girl, so I’m finally going to finish the quilt! By now those lambs the fabric are looking kind of stained, with brownish age spots (like mine!). I’ll finish the stitching and quilt it, following the original blue stitch guides. Then I’ll use the product I developed from my mother’s own formula to remove both the marks and old stains. I like to think that Mama is smiling in Heaven that life has come full circle! I’m hoping one of your readers can help me. I’m looking for a baby sheet set to embroider for future grandchildren. My oldest now 26 received one as a shower gift. It was a simple little pillow case and top sheet. I have looked everywhere and cannot seem to find one. Does anyone have suggestions? It is not hard to find good fabric and make a set yourself. I have made several over the years and they are easy to do. Then decorate as you see fit. Good luck. Great idea. Never thought about just making a set. Look on ebay and etsy for vintage embroidery transfers … you’ll probably find numerous designs meant for baby sheets. Then follow the instructions to transfer those designs to the top of solid color baby sheets. The designs will transfer more easily if you wash the sizing out of the sheets first, and then iron the fabric. I was hoping to do just a little top sheet…never thought about using a fitted crib sheet. Great idea….thank you. Hiya! 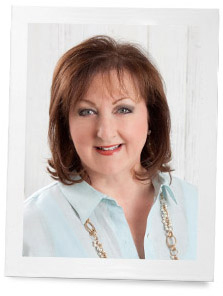 Thank you for your connection here!I believe that it’s quite common that entrepreneurs (and dare I say women, who have been trained for generations that the home is their domain and their responsibility) to balance a unruly schedule (or non schedule). I’m bounced between working all hours of the night, and then slopping around without inspiration. It’s a yoyo for me between the extremes. arlin…this is sooo trueee…..lin..u know what u should do.. together with ur words and ur photo ability… join them together so that people will hear your words…. go for it lin!! jia you!!! ducaldo disse:Concordo inteiramente. InÃ¡cio deve ter histÃ³rias suficientes para para uns dez livros ou mais. E nÃ£o tem mais desculpas, pois ele mesmo tornou pÃºblico que peitou para o Norte por que quer se dedicar Ã s “letras”. Aguardemos. If you cut the pumpkin up very thin it doesnt take any time at all to bake on? a tray in the oven. Say about an extra 10-15 mins. But yes, this method is quicker and easier I agree. puoi presentare le dimissioni anche a partire da un giorno festivo, l'importante Ã¨ che arrivi almeno il giorno precedente.le ferie allungano il preavviso quindi Ã¨ il caso che trovi un accordo con il datore di lavoro.
. Romney said the “The Presidency has that capacity..now.” That “capacity” was enforced by Barackï»¿ Obama, while he over-rode Congress to invade Libya. Get the facts and the truth before criticizing Romney for something Obama has already done! The actions are normal. I dunno if that being a guys standards is though. But hey whatever floats your boat dude. You two can have dutch oven competitions or something. To Professional Peon…that 30 years of holding it must have sucked….I think my whole house just shook with that one. lol. Yes I too have pillow cases from high school unfinished ..you’ve inspired me to complete them as well as other projects that have been set aside over time! Hopefully my self discipline has improved! Wow, that is impressive, especially considering your age when you took it on. It’s a real prize, a treasure. All of your comments have inspired me to pull out my embroidery. I’m in that learning stage and have purchased over the past few years several kits….from little holiday ornaments to pictures. My mom always said there is something therapeutic about hand work. She only sewed by hand including all the beautiful bridal pillows, baby bonnets and beautiful doll clothes including french seams and pleating. Today I’m going to spend some time going through my projects and stitching will be on my schedule before the weekend. When I was in high school I fell in love with a Sunbonnet Sue and Overall Sam quilt my aunt made. She gave me the templates and my mother taught me to needle turn applique. Each one had a solid dress,overalls,hats and shoes with matching color of gingham for their shirts. I always have several “long term” projects and I fit in quicker projects so I don’t get discouraged. I’m working on a crochet queen size Roses and Pineapple bedspread and a pineapple quilt that will have lots and lots of fabric yo-yo’s. Also in high school I started embroidering the State Birds but misplaced my blocks. I recently came across them and plan to make them into a quilt also. I didn’t make all of them and I can’t find the iron on designs so I’ll use what I have. The latest project was “Over the River and Through the Woods” quilt designed by Crabapple Hill. It took me a whole winter to embroider each panel (3 total) and another year to piece it all. After 4 years the top is finally finished and waiting to be quilted (another 4 yrs?). I get the most compliments on it and I am so happy with the results. I used all blue for embroidery and the pieced blocks and borders are in shades of blue. Very striking. I am impressed by your eighteen year old self! At seventeen I hand cut all the squares for a quilt to take with me to nursing school in Baltimore Md., that I still have 68 years later. It is a little worse for wear but still very much loved. Years later my mother gave me the cotton material and patten for me to make myself a bedspread by candle wicking it. She taught me how to candle wick and she took a lesson and made the fringe to go on it. I am sorry to say that after getting three fourths of the bedspread done, I stopped because of an eye problem that I still have. But because of your article on your beautiful table cloth and because I can see well enough now to work on my bedspread I am going to finish it. Will let you know when it’s done. Oh how beautiful! That is something to be so proud of and to cherish. Thank you for the lesson on patience. It certainly paid off in your case. I know that wonderful feeling. I once bought a quilt kit with stamped embroidery on it. There were 47 blocks to make a king size. It took me 20 years to finish each block, assemble quilt and then Hand quilted the entire thing!!! That quilt traveled the world with me being worked on in over 20 countries and 4 continents! I intentionally left a small coffee stain that came from turbulence while flying to South Africa. The stories that quilt could tell. It was quite the accomplishment and elation once completed!!! Your table is absolutely stunning! I can imagine myself sitting down to tea with you and spending an afternoon chatting. Hi Phyllis. In 1984 I purchased a stamped Christmas tree skirt. It was French knots and embroidery, some using gold thread. At the time we had four young children so the treet skirt was put on the shelf. Now that our family is grown I pulled out the kit determined to finish it. When done I took it to our ladies at our parish that quilt. The final project has been under our Christmas tree for three years. It is beautiful and admired by many. Very nice! Everything together makes a lovely table. Well worth the work and time expended. I LOVE hand embroidered tablecloths and coordinating napkins. While I can barely tie my shoes, let alone do anything productive with a needle and thread, I am in awe of those who have the skill, patience, and dedication to create such beauty! I never inherited any fine linens from my mother, but I have bought many at various shops and online and have created new memories with family and friends with these pieces of history! 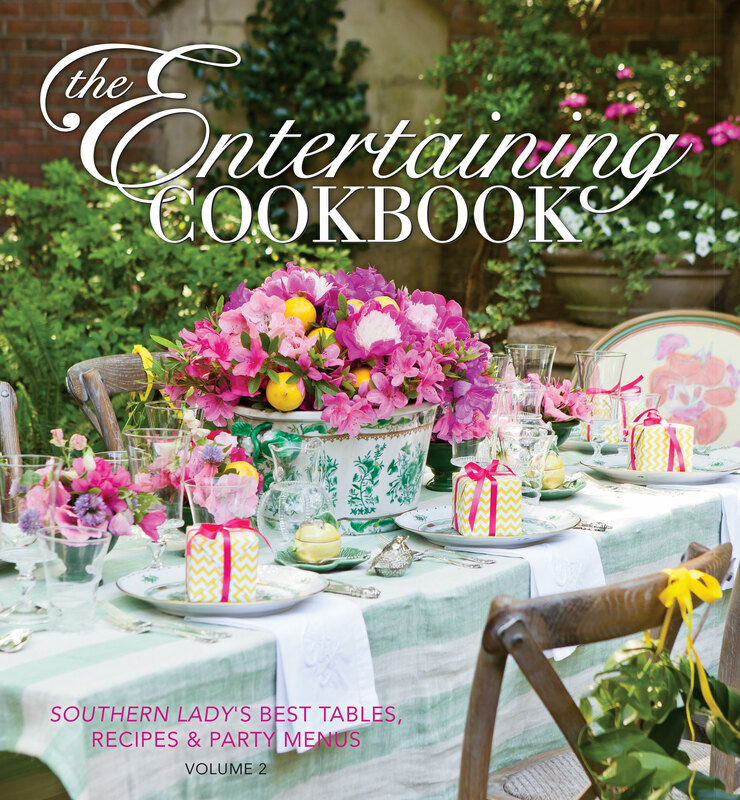 I simply love all things handcrafted and anything to do with fine dining…. 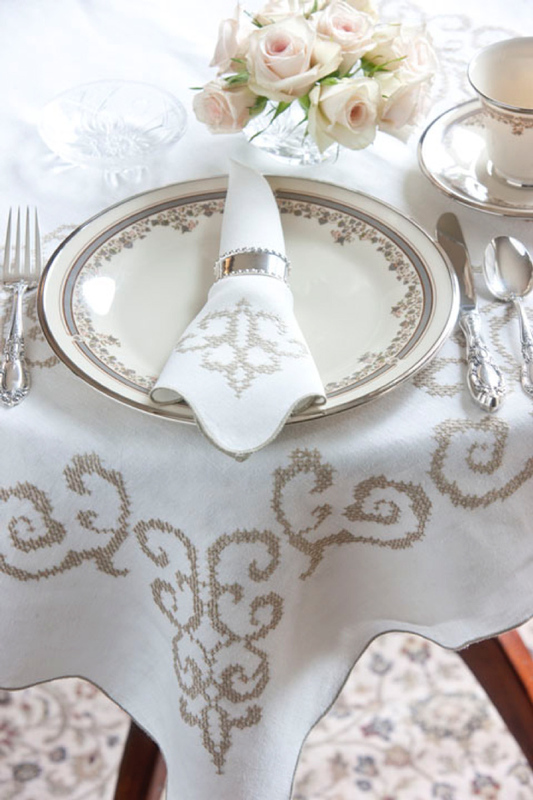 sterling silver, bone china, fine crystal, and of course – beautiful hand embroidered linens!